Washington, County Durham. It's to the west of Sunderland. 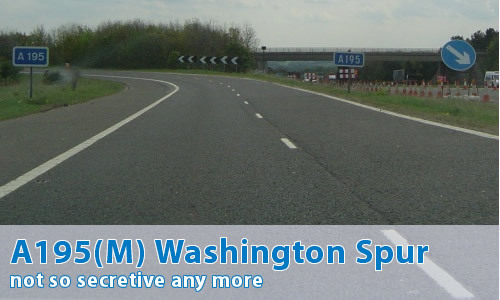 It's another "secretive" motorway - and more to the point, the very first one spotted! It was brought up on SABRE back in July 2003, by Ian Bailey on a thread called A195(M) Washington - the Evidence. Basically, the road is under motorway restrictions, has route confirmation signs along it that clearly say "A195" - hence it's the A195 under motorway restrictions, therefore A195(M)! Then it appeared on the Highways Agency's own website! Just to say that I begged for this motorway to be added a couple of years back. I think that given the slip road configuration at the services exit, the A195(M) has to be the most pathetic motorway in Britain. The services exit itself is a T-junction for goodness sake, and if you want to rejoin the A1(M), you have to CROSS one carriageway of the A195(M). I don't think the A6144(M) can be all that bad by comparison. This is just a strange area overall. I have been travelling this way for 20 years and I am convinced that the roadworks have been continuous for all that time. I particularily remember trying to hitch south from Washington services as a callow youth and realising that the roadworks were both a blessing and curse for the area. The A195 really is a glorified sliproad in the Lancastrian sense and was probably built to make access to Washington somehow better, but was thwarted by the eternal cones.